Latent Class/Cluster Analysis and Mixture Modeling is a five-day workshop focused on the application and interpretation of statistical techniques designed to identify subgroups within a heterogeneous population. Broadly, these techniques can be divided into: (a) cluster analysis procedures that group participants via algorithms or decision rules, and (b) latent class analysis, latent profile analysis, and other finite mixture models that discern latent subgroups of individuals using a formal statistical model. In practice, these methods are often implemented with the goal of identifying theoretically distinct subgroups (e.g., people with a liability for schizophrenia versus those without). Alternatively, they can be used as a data reduction device, to summarize prototypical patterns when working with complex multivariate data (e.g., market segmentation in consumer research). In recent years, an increasing focus has been on multivariate and longitudinal applications (e.g., growth mixture modeling). In this workshop we provide a comprehensive exploration of the foundations and uses of cluster analysis, latent class/profile analysis and finite mixture models, with topics ranging from introductory to advanced, and applications to both single-time point and longitudinal data, as detailed below. Software demonstrations for cluster analytic techniques will be provided in separate R and SPSS breakout groups (you choose which to attend). Later software demonstrations for mixture models are conducted using R and Mplus. While it is helpful to have some familiarity with SPSS and Mplus or R, this is not necessary. The lectures which constitute the majority of the workshop are software-independent. Our motivating goal is to provide an intense yet enjoyable instructional experience that focuses on a large number of both introductory and advanced topics in cluster analysis and mixture modeling. We strive to strike an equal balance between core concepts of the analytic techniques along with their practical application and interpretation when implemented with real empirical data. Our workshop is designed to provide participants with the materials and instruction needed to both develop a real understanding of cluster analysis and mixture modeling and to be able to thoughtfully apply these procedures to their own data. Dan and Doug are obviously experts, but their delivery and ability to communicate and answer questions was incredible (something that is not common among experts). The climate was relaxed and conducive to learning. I would highly recommend it! I really appreciated the balance between theory and application and that syntax files were provided so that we have them to build off of for our own analyses. Good experience and very clear — very responsive to questions and mindful of a range of statistical expertise. Doug and Dan are good presenters and clearly keep up with the latest developments. As a developmental psychologist, I appreciated all the examples presented in class. Great instructors who really know their stuff, offer a great survey of material, and are really ready to help! Dan Bauer and Doug Steinley co-teach the workshop and alternate lecturing throughout the day. We provide approximately 35 hours of total lecture time as well as a bound copy of the course notes and the computer demonstrations (approximately 600 pages total). 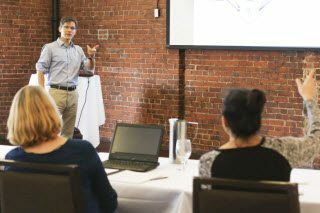 Although there is not a hands-on computer lab component to this workshop, we provide extensive live demonstrations in R, SPSS, and Mplus, and we distribute the data and code for all examples. Further, participants are welcome to bring personal laptop computers to follow along with the software demonstrations or to work on their own data applications. We begin each day at 9:00 and continue until 12:15 with a mid-morning break. Lunch is from 12:15 to 1:30 and attendees can select from a large number of restaurants in the downtown area. The afternoon session continues from 1:30 to 5:00 and includes a mid-afternoon break, although the workshop ends at approximately 3:30 on Friday to allow time for travel. On Monday through Thursday, we will conduct software demonstrations from 3:30 to 5:00. For data visualization and cluster analysis demonstrations, Dan and Doug will lead separate breakout groups using SPSS and R, respectively. For latent class and mixture models, Dan will demonstrate Mplus while Doug will continue to demonstrate R. Finally, we will host a happy hour on Monday at 5:00 with appetizers and drinks. We have reserved a block of rooms in the Hampton Inn at a reduced rate that will be available until four weeks prior to the workshop or until the block is sold out. The hotel offers a wide range of amenities including workout facilities, a swimming pool, coin operated laundry, and much more. Rooms can be booked through online reservations or via phone at 919.969.6989 (refer to MIX group code). 8.5 Latent Class Moderation Analysis: Do Predictors Have Differential Importance Across Classes?